I normally don’t ooh and aah about salad dressing. It was one of the first things I learned to make for myself. More than just a drizzle of olive oil and a squeeze of lemon juice, I learned to balance acid and salt with a little sweetness, to bring my ingredients together before blending with oil to make an emulsion. It’s a simple task, but one that can turn a regular salad into something extraordinary. MOMO changed my mind about pre-made salad dressings—I had just been trying the wrong ones all along. 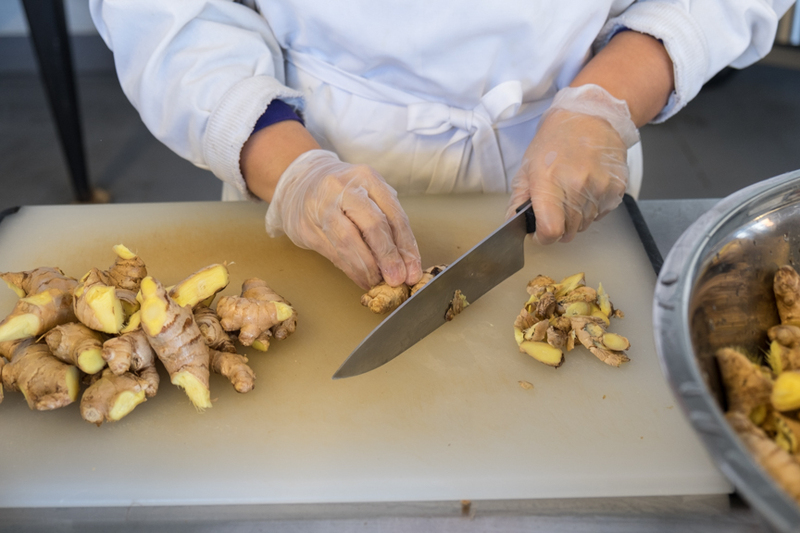 I grew up eating ginger dressing on special occasions with my parents at sushi restaurants, and now that moment—that memory—has been captured in a bottle. It was mostly children that stopped to teach Momose new words, excitedly asking if he knew the English for baseball or broom. But after they sampled the dressing, they called their parents over to buy some. This face-to-face, personal connection lit a fire under the future of MOMO Dressing. Momose met his wife, Yukimi, in an English class in 2010. They started dating, were married soon by 2013, and immediately starting MOMO Dressing. 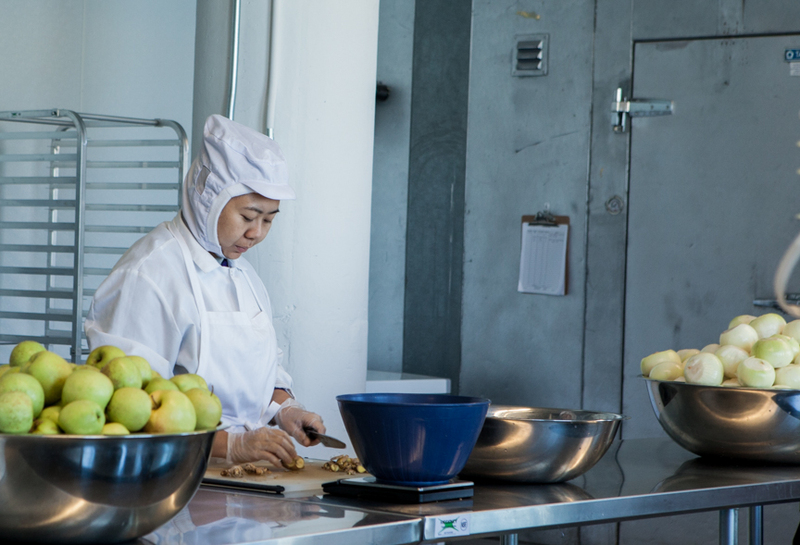 Though they are equal partners in the business, Yukimi runs the kitchen operation with a dedication to innovative products, seasonal recipes, and farmer’s market exclusives. MOMO buys their fresh produce ingredients from the farmer’s market stalls that surround them. The couple maintain close relationships with individual farmers, buying carrots, ginger, and onions whenever they are available. Momose told me he’s not worried about making it big right away. He wants to grow the company and do things the right way—he sees it as a marathon, not a sprint. But MOMO is growing. They’ve branched out from their humble farmer’s market stall to build a presence in about 26 Whole Foods in the tri-state area and in many independently-owned local businesses. Relationships are a centerpoint of the MOMO business, which is why they’ll always set up shop at farmer’s markets. He believes that coming face to face with your customers gives you access to the kind of direct feedback that you can’t get from selling in someone else’s store. When customers asked for gluten-free products, MOMO switched out regular soy sauce for a more expensive ingredient: gluten-free tamari. His margins are smaller, but his customers are happier. MOMO customers are so loyal, Momose recently created a punch card for people that bring back their empty glass dressing bottles. “It’s cheaper for us to buy new empty bottles, but we still take back the old bottles and completely clean and sanitize them,” Momose said. It may not be economical, but it is environmentally friendly—just another way MOMO prioritizes values over profit. And, of course, it gives the MOMO team another chance to interact with customers, ask for feedback, or find out how customers are using their dressings. The punch card system is old hat for, say, a coffee company. But I can’t say I’ve ever seen a punch card for salad dressing. 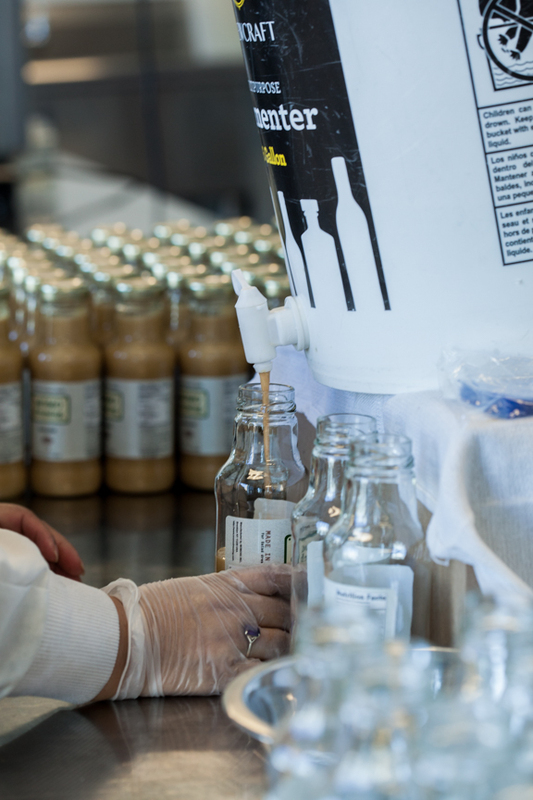 With a team of about six people, MOMO does their own distribution and production, making extremely small batches, bottling by hand in their small facility in the Brooklyn Army Terminal Annex building. “Some companies get a big order and just have a co-packer make the product. They want to sell out, but that’s not my vision.” Momose envisions that MOMO will still be a brand in 100 years, so he doesn’t mind if it’s growth is slow to start. In the meantime, he can focus on doing things right and building lasting relationships with his customers and in his community.